Renovations are underway at the Colvin Run Mill Historic Site’s miller’s house, and pleasant, historic surprises are being discovered. Consider this one an unintentional time capsule. The house is getting new shingles, and it may not be surprising that nails were found during the renovation – but these nails from the building’s roof appear to be originals from the time of the house’s construction. The Park Authority’s Heritage Conservation Branch Manager, David Buchta, confirmed that when he examined them. “They are all hand headed and appear to have been made from nail stock,” said Colvin Run Mill Site Manager Mike Henry. Biggest mole holes you’ve ever seen? Nope, just test pits being dug by Fairfax County Park Authority archaeologists in a new search to uncover the past at the Colvin Run Mill Historic Site. Colvin Run’s main feature is a restored and working mill – a water-powered technological marvel built around 1811. But among the other structures on the site is the Miller’s House, home to the families that operated the mill. In 2011, a formal Historic Structures Report for the house identified problems with the structure and recommended steps needed to preserve and maintain the facility for generations to come. Funded by bond money, that treatment plan is now set to be implemented. One of the proposed improvements is the installation of a ramp that will allow mobility-impaired patrons to experience the building. Because installation will disturb the ground at the historic site, archaeology began on the property before work commences. Swinging into action, archaeologists Alisa Pettitt and Jonathan Mayes from the Park Authority’s Cultural Resource Management and Protection Branch mapped a grid around the house and began to dig. Documenting every shovelful of earth they turned, the team conducted a systematic search around the house, uncovering artifacts and clues as they went. More than two dozen shovel test pits were opened and explored. 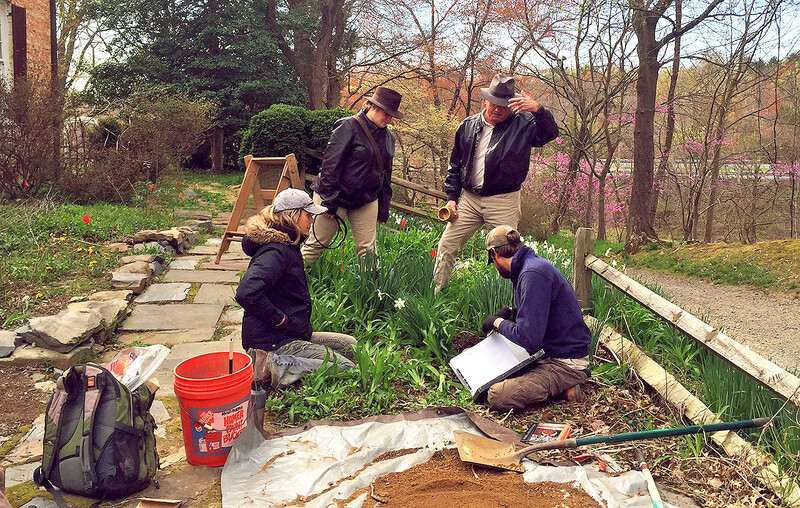 Combining the information they uncover with historic documents, the archaeologists will be able to piece together some of the activities that occurred at the Miller’s House. Their work will reveal any past features that might be present and, hopefully, provide data that will both assist in the restoration and interpretation of the building. During excavations at the house, archaeologists discovered intact features and an intact soil layer that had not been impacted by modern activities. Although most of the artifacts recovered from tests were architectural, such as bricks, nails, and window glass, there were several unique finds. A ceramic doll arm, discovered on the east side of the house, evoked images of a young child playing in the yard on a spring morning. A piece of lead shot from the west side of the house called to mind hunting activities. A small fragment of Jackfield ceramic, which dates to the late 18th or early 19th century, was usually made in the form of coffee or tea services, suggesting an important activity of the time. The excavation, analysis and preservation of these and other artifacts offer a window into the lives of the folks who lived and worked at this historic mill. While the final analysis and report has yet to be written, the process of uncovering fragments of the past has added an additional sense of excitement to the restoration project. The story of the Miller’s House and its generations of inhabitants will continue to unfold one shovelful of clues at a time. Colvin Run Mill Historic Site is located at 10017 Colvin Run Road in Great Falls, VA. Author Mike Henry is the Site Manager at Colvin Run Mill. Co-author Dr. Elizabeth Crowell is the Cultural Resource Management and Protection Branch Manager for the Park Authority. This entry was posted in Uncategorized on May 2, 2016 by Fairfax County Park Authority.